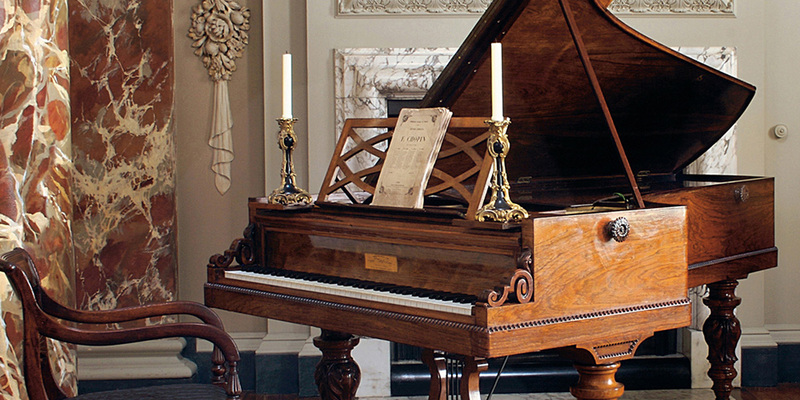 Chopin, who preferred Pleyel pianos above all others, chose this piano shortly after it had been completed in January 1848. It appears to be the piano depicted in a watercolour of his salon at the Square d’Orléans, Paris. Chopin almost certainly used it for his last concert in Paris in February 1848. He brought it with him to England in April and gave his first London concert on it. The Pleyel ledgers for No. 13819 record that the composer was billed 2200 francs for it and in letters Chopin referred to it as ‘my own’ instrument. On leaving London he sold the piano to a Scottish friend, Margaret Trotter, and it remained with her Lindsay relatives until 1981.